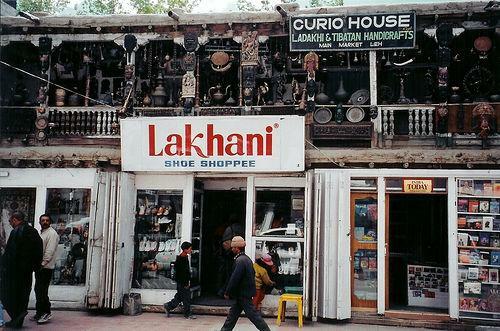 Shopping in Leh is no doubt a unique experience especially for those who visit this spectacular city as a tourist. When you are in Leh, you will enjoy shopping to the fullest as most of the items you get there are exclusively found in this region and not to be seen anywhere else. Huge numbers of shops of different genres will help you satisfy your shopping spree to the fullest. 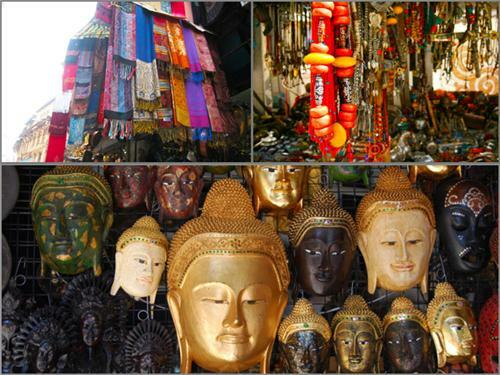 You get endless opportunity to shop varieties of items from various market areas in Leh. Some of the items like handlooms and handicrafts of Ladakh depict finest craftsmanship of this region. This article will provide you with information about all types shopping options in Leh. Leh is like a paradise for the ardent shoppers. All types of Tibetan artifacts, traditional handloom and handicraft items, carved wooden items, hand woven shawls, rugs, gloves, socks , jewelry items made of corals, turquoise , beads and metals, thangkas, prayer wheels and others items are available in different shops and emporiums of Leh. As this region has plenty of fruit produced especially apricots, you get fresh fruit juices, dry fruits and fresh fruit items here in these shops. Local horticultural products are also sold in various organic shops in Leh. When you are in Leh then you have to buy Pattu, a special handloom work exclusive to this region. It is a woolen fabric work that attracts the viewers with its intricate design and weaving. Woolen shoes, hand woven carpets, sweaters, gloves, socks etc. are also found in great numbers for the ardent shoppers. Many take home the hand-woven carpets and rugs made from the hair of Ladakhi Goats. They either use them as wrappers or use them as an item for wall decoration. Shawls or rugs with floral or dragon motifs are also exclusive to Leh Ladakh. You will get varieties of handloom items in all the shops located along the roads in the main market place. Tibetan Handicraft Emporium, Ladakh Art Palace etc. are some of the renowned shops which have huge collection of handlooms for the buyers who get them at considerable price. You can visit Jigmet Couture if you are looking for something different where you get amalgamation of traditional values and modernization. Shops located at Tibetan Market off Leh Road (Old) are the best places for buying clothes and handlooms. Tibetan Thangkas, wall paintings, twig baskets of all sizes, prayer wheels, miniature stupas etc. 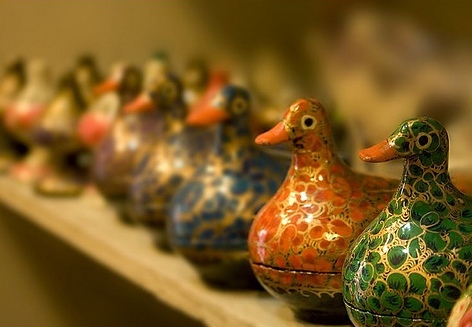 are created by expert artisans and are some of the most sought after shopping items for the visitors. All these items depict the local culture and tradition of this region and buyers take huge numbers of these items home to gift their friends and dear ones and also to decorate their houses. Tibetan Masks are the integral part of culture and heritage of this place. These marks are used during various religious and social ceremonies. Varieties of Tibetan masks are available at different shops located all over Leh. You will get wide array of handicrafts at Cottage Industries Exposition, Women’s Alliance, Ecology Center at Changspa and the showroom of Tibetan Handicraft located at Choglamsar. Leh is famous for different types of metal works. It also has huge numbers of artisans who are the bearers of their age old metal art tradition. These artisans’ ancestors who had settled down in Ladakh region decades ago were experts in metal works. Descendants of those artisans still reside in villages around Leh and have been working with different types of metals producing excellent metal items. You will get items made with brass, silver and copper. You will get to see utensils like bowls, ladles, pots, teacup stands, hookah bases etc. made with different types of metals. Tourists as well as the locals keep flocking for buying metal items in different shops of Main Market, Moti Market or Gol Market area in Leh. Leh Ladakh people wear jewelry items that are exclusive to these regions only. Jewelry pieces made with metals, beads and stones depict the cultural heritage of Leh Ladakh. 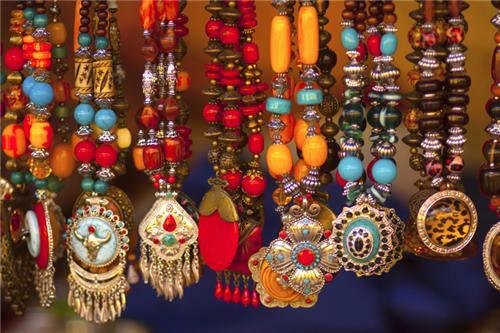 You will get huge collection of traditional jewelry items in various shops of Leh. Jewelry items made with turquoise and corals are also the signature mark of Leh. Visit Ladakh Art Palace, Dalai Lama Charitable Trust, and other emporiums are the best places to buy authentic Tibetan Jewelry items. Apricots are grown in great numbers in Leh Ladakh area. You will get varieties of items made of apricots and other fruits. You get fresh apricot, apricot fry, dry apricot or apricot jams at various markets of Leh. Ladakh Apricot Store is the best place to look for all types of fruits and fruit items at reasonable price. You can also get fruit items at Dalai Lama Charitable Trust Handicraft Emporium and other emporiums. Leh houses many bookshops where you will not only get the regular magazines or news papers but you will also get trekking maps, tourist guides and other informative books or magazines. Ladakh Book Store, ABC News Agency, Book Worm etc. are some of the most popular places for book shopping. Being a hill station, you can easily find long boots in Leh. The shoes sold at the footwear stores in Leh are the best to combat with the chilly weather of Leh.